In celebration of St. Patrick's Day and in anticipation of the Oscar nominated animated film The Secret of Kells which I can't wait to see, this month's project is Celtic knotwork. I made a hot dog booklet from the back panel of a brown grocery bag and followed directions on the web for making Celtic knot designs. There are directions using graph paper but I preferred the simpler way of drawing the design in crayon, marker, or colored pencil and then adding the outlines to make the interlocking knots. This short video promoting the DVD gives some close-up views of pages from the Book of Kells. You can purchase a copy at John Neal Booksellers. You can watch the film's trailer here. This was my favorite site for Celtic knots. It was here I found the draw first, outline later method which is called felt-tip pen on the website. There are also outlines which you can print and color or trace over and then add outlines as well as lots more information. I liked this site a lot too. There is a method of drawing your own simple grid and then building the knotwork design. 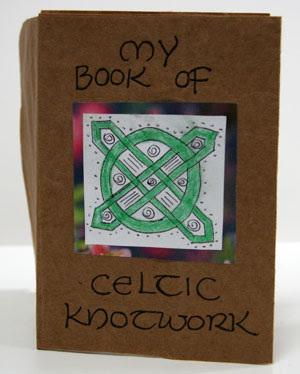 My friend Deirdre has been using Celtic knotwork in amazing ways in her work for many years. You can see samples of her work here.